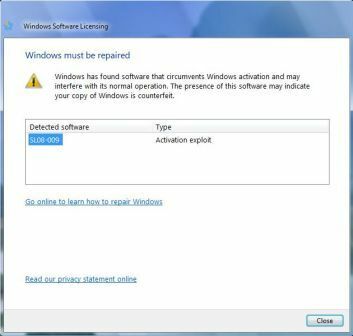 Microsoft has decided to tighten the grip on ability for pirates and crackers to crack and bypass Windows Vista activation scheme, by releasing an WGA update to Windows Vista Ultimate Edition based system that will detect the presence of SoftMod hack activation exploit, which is currently been pioneered by Vista Loader. However, it’s unclear if the WGA technology update will indeed detect both SoftMod and Vista Loader, or just SoftMod activation crack, which is the predecessor version to much enhanced Vista Loader. SoftMod and Vista Loader activation exploit works by modifying boot loader to load a simulated OEM BIOS image with necessary BIOS string in order to activate Windows Vista with respective OEM master product key straight away as if the OS is factory installed without the need to verifying against Microsoft activation server, a convenient provided by Microsoft to OEM manufacturers and customers. Previously, with the release of Windows Vista SP1 and KB940510 update, Microsoft has managed to shut down illegal Windows Vista PCs activated with Grace Timer, notably TimerStop, OEM BIOS which apply only to Paradox OEM BIOS Emulation, or their variants. In fact, many hackers have wondered by Microsoft does not cramp down on SoftMod activation crack sooner, as SoftMod modifies system files that can be easily detected. According to WGA blog, the new technology update will be releasing to Windows Vista Ultimate Edition only at this time and only to systems with English as their primary language. In history is correct, the update will soon apply to all Windows Vista systems in a few months. After installing the update, if the system has detected the SoftMod activation exploit, the following screen will be shown, with warning that reads “Windows must be repaired. Windows has found software that circumvents Windows activation and interferes with its normal operation. The presence of such software may indicate that your copy of Windows is counterfeit.” Te crack is labeled as SL08-009. However, detection of SoftMod crack won’t disable the computer, and all functionality of the system continue to be usable. The updte will simply alert the user if the system is affected (or installed) with SoftMod, OEM BIOS and Grace Timer activation exploit, and will provide more information about that exploit and how to fix or remove the crack.